Don't worry, most stores will let you shop until Santa arrives. Last-minute gift-givers face several challenges, particularly when the holidays approach. Some stores maintain hours that go far beyond their normal posted schedule to cater for those who have saved their shopping trips until the last minute. However, recent backlashes have sprung up across the country, with some consumers saying that shoppers -- and store employees -- should be able to spend more time with their families rather than at the mall. Therefore, many retailers appear to be taking a measured approach to creating their holiday hours. 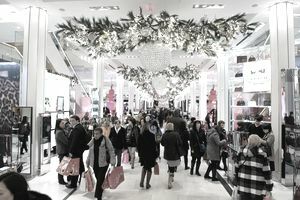 Although most still offer extended hours, many are staying closed on the big holidays, such as Thanksgiving and Christmas day. Following you'll find a breakdown of some of the more common holiday hours that have been posted over the last few holiday seasons. Remember that these hours are a general guide, and some locations may have slightly different schedules. Be sure to call your local store before you head out to purchase that last-minute present. How late a store can stay open depends in large part on its location. If it's in a shopping mall, they may be bound by contractual agreements with mall management, whereas standalone stores may have more flexibility. And some stores may have further restrictions during years when Thanksgiving, Christmas Eve or Christmas falls on a Sunday. Burlington Coat Factory: Most stores will open at 7 or 8 a.m. and stay open until 8 or 9 p.m.
Nordstrom: Opens at 8 a.m. until either 5 p.m. or 6 p.m.
Old Navy: Open from 7 a.m. until midnight. Barnes and Noble: Open 7 a.m. (in some locations) until 6 p.m. Christmas Eve. Bed, Bath and Beyond: Most stores remain open until at least 6 p.m. on Christmas Eve. Best Buy: Open from 8 a.m to 11 p.m.
BJ’s Wholesale Club: Open Christmas Eve from 8 a.m. to 6 p.m.
Costco: Most stores open 9 a.m. to 5 p.m.
J.C. Penney Open 7 a.m. to 6 p.m.
Macy's: Open Christmas Eve from 7 a.m. until 6 p.m.
Meijer's: Most stores open Christmas Eve noon to 7 p.m.
Target: The department store will have most locations open from 7 a.m. to 10 p.m. on Dec. 24. Sam's Club: Open regular hours 10 a.m. to 7 p.m.
Walmart: Most Walmart stores close at 6 p.m.; opening times will vary. If you forgot something you want to serve for Christmas Day dinner, there are some grocery stores that typically offer extended holiday hours. Albertsons: Albertsons typically remains open on Christmas Eve until 9 pm. Harris Teeter: Most locations close at 7 p.m. Christmas Eve. Kroger: Many will keep regular hours, some will stay open until 7 p.m.
Publix: Most stores close at 7 p.m. Christmas Eve. Trader Joe's: Closes at 6 p.m. in most locations. Whole Foods: Most stores will open at their usual time and close at 8 p.m.